Recognizing the rise of anti-microbial resistant (AMR) bacteria as a global public health threat, Generika Drugstore embarked on a long-term, comprehensive campaign against it since June 2014. Enabled by Administrative Order 42 (2014) under the Aquino Administration, they have achieved notable in-roads in curbing the rise of AMR in the country – a health threat caused by the excessive and inappropriate use of antibiotic medications. 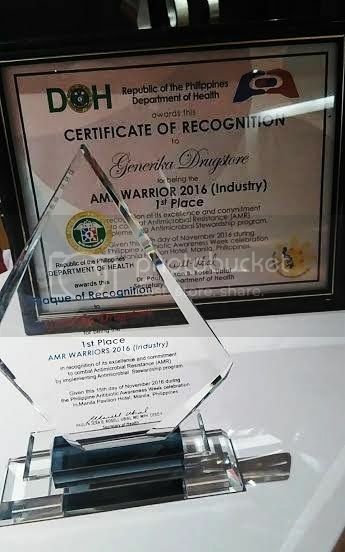 To honor these efforts, the Department of Health (DOH) rewarded Generika Drugstore with a first-place award in AMR Warriors 2016: Best Practices to Combat Antimicrobial Resistance – Industry Setting category. Generika was the only drugstore contender in a category dominated by multinational manufacturing companies. 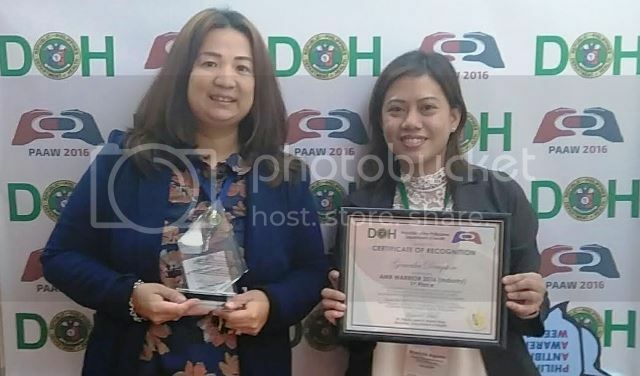 Photo Caption: Generika Corporate Pharmacist and Regulatory Head, Ms. Mary Rose Ulit (left) is accompanied by Generika Pharmacist, Ms. Mariciris Aquino (right) to receive the award on behalf of Generika Drugstore at the Philippine Antibiotic Awareness Week ceremony held at Waterfront Manila Pavilion Hotel last November 22, 2016. Through Generika’s efforts, their customers no longer treat antibiotics as cure-alls. Sustained educational talks during community activities and in-store patient consultations helped decrease unnecessary consumption of antibiotics such as amoxicillin by over 50% in 2015 alone. Now more Filipinos understand that these medications must only be used when prescribed by the doctor. The Gamot Guide, a printed-out sheet containing key medicine information and dosage details, are among the tools that help Generika educate the public about AMR and the proper use of antibiotic medicines. To learn more about Generika Drugstore and their public health advocacy, simply visit http://www.generika.com.ph/ or like its Facebook page at https://www.facebook.com/Generika.com.ph.